Macau (Macao SAR) – October 24, 2018 (travelindex.com) – The seventh edition of Global Tourism Economy Forum (GTEF or the Forum) was unveiled today (23 October). A grand welcome dinner was hosted by the Macao Special Administrative Region Government at Wynn Palace tonight to welcome delegates from near and afar, and convey the best wishes to the Forum for a great success to inspire closer tourism cooperation across the globe with innovative insights. The dinner was attended by over 1,000 Forum delegates. The dignitaries include Vice Chairman of the National Committee of the Chinese People’s Political Consultative Conference and Forum Chairman of GTEF, Ho Hau Wah; Vice Chairman of the National Committee of the Chinese People’s Political Consultative Conference, Chairman of All-China Federation of Industry and Commerce (ACFIC) and Honorary Chairman of GTEF, Gao Yunlong; Secretary-General of the World Tourism Organization (UNWTO), Zurab Pololikashvili; Deputy Director of the Liaison Office of the Central People’s Government in the Macao Special Administrative Region, Yao Jian; member of the leadership of the Ministry of Culture and Tourism of the People’s Republic of China, Yu Qun; Vice Governor of Guangdong Province, Xu Ruisheng; Counsellor and Head of Trade Section, European Union Office to Hong Kong and Macao, Eva Valle Lagares, and 28 representatives of the European Union (EU) delegation, among other guests. At the dinner, souvenirs were presented to representatives of the European Union (EU) as GTEF 2018 Partner Region and Guangdong Province as GTEF 2018 Featured Partner Chinese Province, as well as GTEF’s collaborative partner, supporting units and sponsors in token of appreciation for their support. International and local guests took the opportunity to connect and build friendships with each other during the dinner. 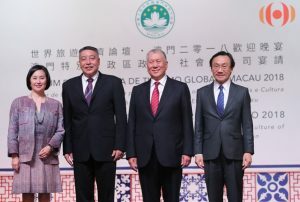 As a high-level exchange platform hosted by the Secretariat for Social Affairs and Culture of the Macao SAR Government, the 7th edition of Global Tourism Economy Forum unfolds a series of thought-provoking discussions and panel sessions under the theme “Strategic Partnership in a New Era, Rising Momentum for a Shared Future”. The Forum will continue tomorrow (24 October) with its Day 2 program, including two Special Keynotes on “Tourism Development in Greater Bay Area” and “Building a Travel Ecosystem and a New Lifestyle”; several discussion panels themed as “Greater Bay Area Session Part I – China Enterprises Perspective” in cooperation with All-China Federation of Industry and Commerce (ACFIC); “Greater Bay Area Session Part II – Macao Perspective” in cooperation with The Macau Chinese Enterprise Association; and “Technology – The Virtual Bridge” in cooperation with Pacific Asia Travel Association (PATA). There are also an array of concurrent sessions namely Youth Leaders Roundtable Meeting in cooperation with Greater Bay Area Youth Federation, “China Outbound Tourism” in cooperation with Ivy Alliance, “Gastronomy, Creativity, Tourism” in cooperation with UNESCO, Trade and Business Presentation, and PET Conference in cooperation with European Tourism Association (ETOA) and The European Travel Agents’ and Tour Operators’ Association (ECTAA).